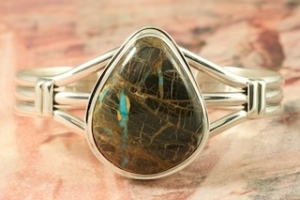 Genuine Sunnyside Turquoise Stone set in Sterling Silver Bracelet. The matrix on this rare stone is outstanding. The Sunnyside mine is located in northern Nevada near the town of Tuscarora in the Tuscarora mountain range. The mine is no longer in operation as it has become part of a gold mining operation and a privately owned ranch. The Sunnyside mine was mined mostly in the 70's. You won't find much of this great turquoise around anymore except for old stashes. Created by Navajo Artist Joe Piaso. Signed by the artist. The turquoise stone is 1 1/8" x 1".